In 1742, the then governor of French-held Mauritius, Mahe de La Bourdonnais, sent a vessel to investigate what is now known as the Seychelles islands. Captain Picault, who was in charge of this initial voyage, named the island of Mahe after his governor, as was common practice in those days. Mahe, the seat of Government, is the largest island in the Seychelles group. The International Airport is situated here, as is the port and the capital – Victoria, named in honour of Queen Victoria. In 1903, Seychelles became a separate British Crown Colony and a Clock Tower (commonly referred to as Little Ben), a replica of London’s Vauxhall Bridge Tower, was erected in the centre of Victoria to commemorate both the event and as a memorial to Queen Victoria who died in 1901. The Clock Tower was originally expected to chime, but failed to do so. Today it strikes regularly on the hour. Although more developed than the other islands, Mahe still has many unspoiled corners, ranging from quiet sandy beaches and coves to lush forests, cinnamon and tea gardens which clothe the mountain slopes. 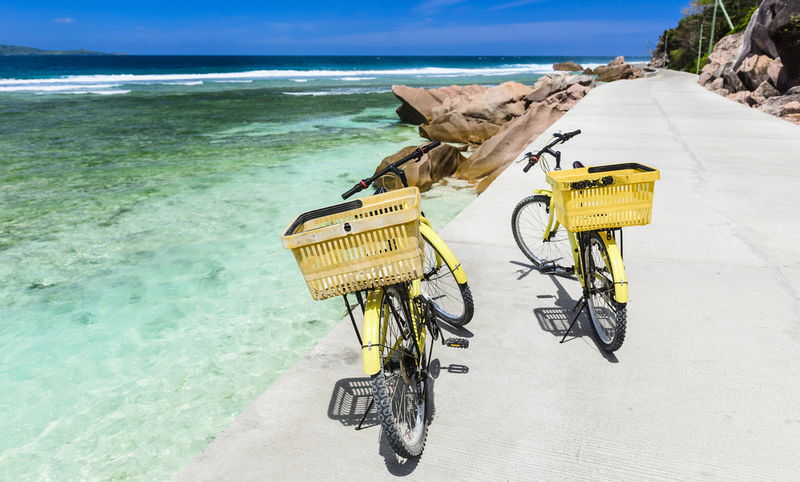 A leisurely tour of the island by car will take 2 to 2 1/2 hours and reveal the lion’s share of Seychelles’ beauty and charm, majestic beaches, places of cultural interest and other attractions. Mahe is the gateway of the Seychelles Islands, perfectly placed for island hopping and day excursions via air and sea. Praslin is named after the Duc de Praslin, the French minister of marine in 1768 when the ‘Stone of Possession’ was erected at Anse Possession. Praslin lies 45 kms North East of Mahe and is accessible by boat in one hour or by air in 15 minutes. Praslin is best known for its Vallee-de-Mai Reserve, home of the renowned Coco-de-Mer palm. These double nuts grow on over 4000 trees in the vallee, some reaching to 30 metres and giving this unique spot a second name – “Valley of the Giants”. The tallest of these ancient palms in the valley are estimated to be over 800 years old. Six species of endemic palms can also be found on Praslin. The elusive Black Parrot is amongst the very rare endemic birds to be seen in the Vallee-de-Mai. Others include the Seychelles Bulbul and the beautiful Blue Pigeon. In the mid 1800’s, Praslin’s Côte d’Or was a favourite haunt for pirates before the French settled, bringing with it tales of riches and buried treasure. Praslin is also the proud home of the world famous Anse Lazio and Anse Georgette beaches, which have been voted time and time again as two of the most beautiful beaches in the world. La Digue is named after one of the vessels in explorer Marion Dufresne’s fleet, which in 1768, was sent by the French to explore Seychelles’ granitic islands. An aura of charm and tranquillity surrounds the island of La Digue, some hour and a half by boat from Mahe or 30 minutes from Praslin. The island’s rare calm and the friendliness of its people are too precious to be passed by in haste. Wide deserted beaches are perfect for long walks, safe swimming, snorkelling and fishing from a local pirogue. Take a step back in time and visit L’Union Estate – see a traditional copra mill and kiln (kalorifer), watch the antics of the estate’s population of giant land tortoises or stroll around the majestic Plantation House framed by giant granite boulders in landscaped gardens. The estate is also home to the cemetery of the original settlers of La Digue and to one of the most pristine beaches in Seychelles – the legendary ‘Source d’Argent’ – among the most photographed beaches on earth. In the woods of La Digue are the very rare Black Paradise Flycatcher breeds. Although this bird was once thought to be extinct, recent estimates suggest that their numbers are increasing. La Digue’s forests also contain a wealth of flora and boasts delicate orchids, vanilla vines, vibrant hibiscus, coconut plams and trees such as the native Indian almond and Takamaka tree.